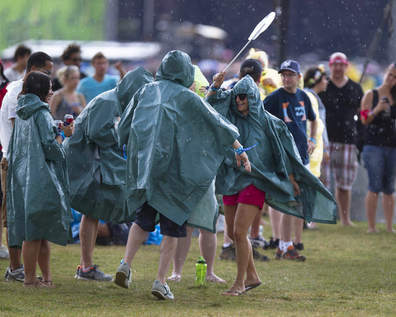 2013 Lollapalooza Damage "only" estimated to be $300,000 this year. These first two pictures are of Butler Field (north of Buckingham Fountain). These are the steel mats and plastic mesh that were used in 2013 to protect the grass. Let's see how well the mats and plastic mesh protected the grass....Better this year, however is that good enough? 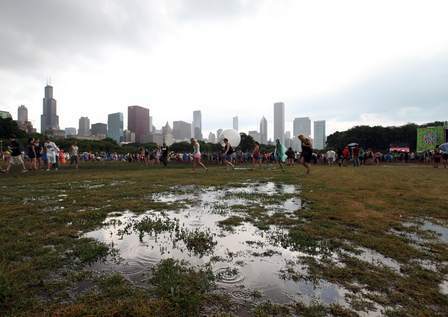 Prior to the 300,000 persons visiting Lollapalooza during the 3-day event, this was all green grass. These next two pictures are from the far end of Grant Park, where a secondary stage was set up. Apparently the park district approved an experiment with a stage built with 4x4 timbers. However, here is a picture of a tear-down worker removing nails and leaving them in the grass. The park district should require a magnetic bar to be dragged across that entire area to pick-up the majority of the nails, to prevent injury to park visitors in the future. Workers removing 4x4 supports from wooden stage. Using hammer to remove nails, then dropping in the grass. The park district and the city should be asking themselves if this annual destruction of Chicago's Front Yard park is appropriate. Should we endure the 4 to 6 weeks each year that it takes to regrow or replant our relatively formal front yard? The intensity and duration of this 3-day event seems to be perfect for Northerly Island, where the stage locations can be changed from year-to-year...and the view is even more spectacular. And there will be room for the promoter to expand and for attendance to increase to meet the growing demand. The concert series tickets now sell out in a few days, and will remain increasingly popular in an equally attractive and more appropriate location, such as Northerly Island. The other half of the equation is the issue of encouraging residential development in the downtown area, and then ignoring the Illinois noise limits for adjacent residents. Chicago imposes none. To consider that growing problem, click here. These are Sun Times online pictures from the Friday, August 2. 2013 brief rain. They show similar fun playing in the mud, that seriously destroyed areas of Grant Park during Lallopalooza 2012 and 2011. In 2011, the damaged areas were completely restored according to the contract, and that required expensive sod. Apparently the politically connected promoter C-3 Presents wanted to retain more of the profits, similar to 2012 .So now the public will be looking at large sections of black dirt and seed for a couple of months.